CATIA is a CAD package which provides engineers to bring the ideas into the reality. 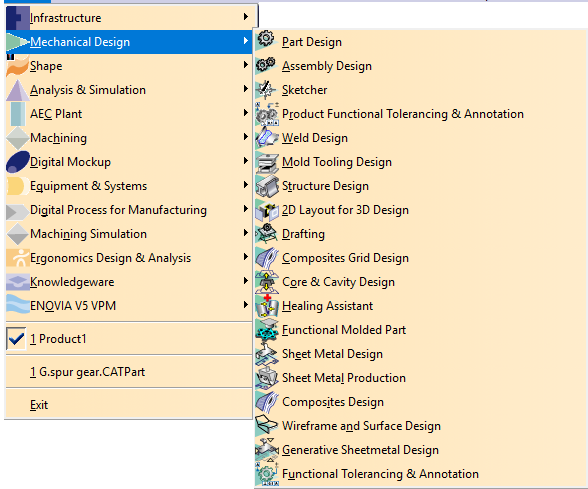 Following are the list of workbenches in CATIA that can help engineers to shape their ideas. Involve the part design, sheet metal, and surfacing, molds, structure design for the production and manufacturing. 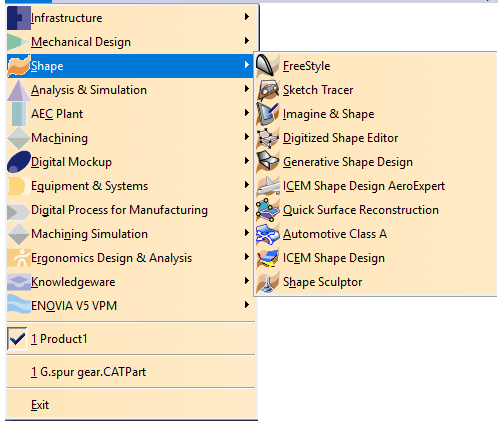 Generative Shape Design (GSD) helps to design advanced shapes based on a combination of wireframe and extensive multiple surface features, with full specification capture. 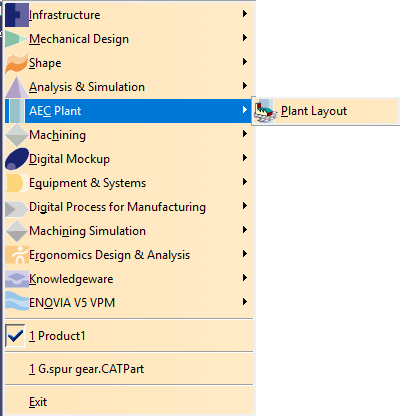 Layout design for a manufacturing plant or other type of plant. The main focus of the product is to allow the preliminary or conceptual design of a plant to be accomplished quickly. 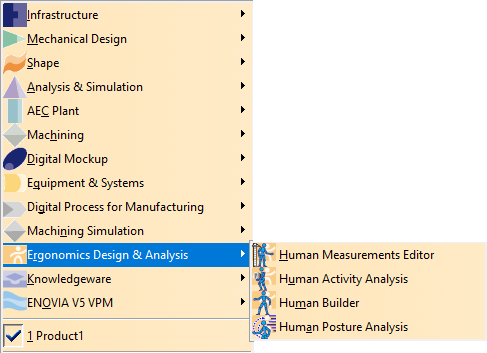 It provides an efficient, cost-effective way to lay out an initial plant design for review and validation. All the machining process can be defined for CNC in this module. 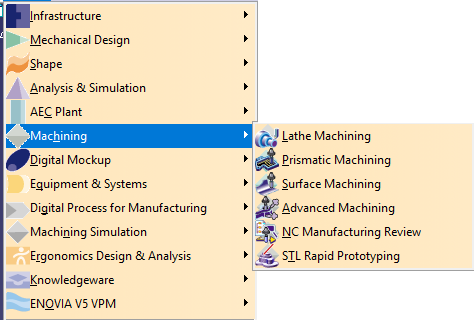 see the below picture for the list of machining operations possible in CATIA. DMU allows engineers to design and configure complex products and validate their designs without ever needing to build a physical model. 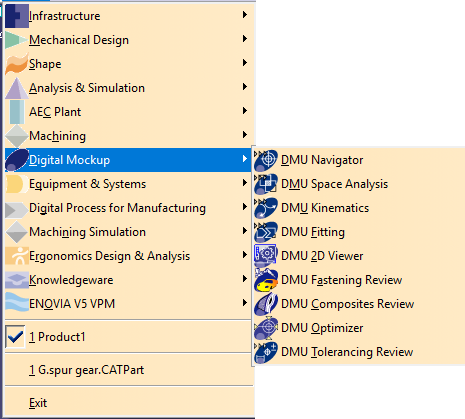 See the following image for the list DMU features. DMU kinematics is mostly used to simulate the mechanics. this provides all type of mechanical joints existed in this universe. and the remaining are also provide the feature to mock up the product. Design and integration of electrical, fluid and mechanical systems within a 3D digital mock-up while optimizing space allocation.Creation of circuit boards and design of structural products, cable harness. 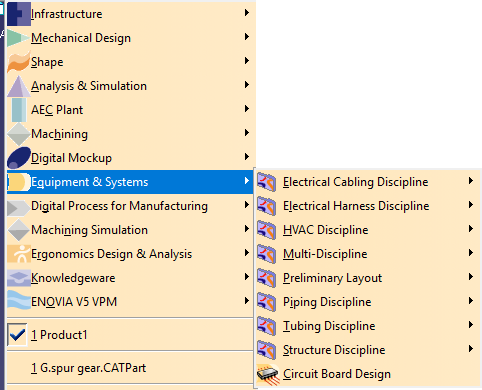 see the list of Equipment & systems module features. 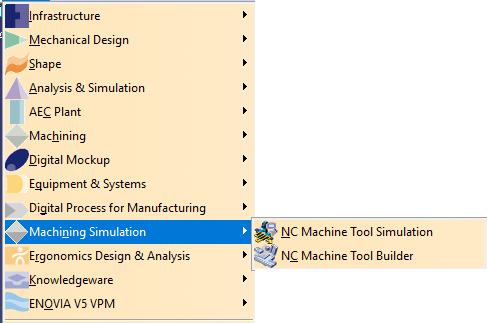 simulation of NC machine tools can be done with this module. we can build NC machine tool with this module. The meaning of Ergonomics is the study of people’s efficiency in their working environment. Which is a branch of science that aims to learn about human abilities and limitations, and then apply this learning to improve people’s interaction with products, systems and environments. Anyhow CATIA is a great tool for the Aerospace and automotive industries due to its Generative shape design capabilities. and software is a bit costly too. see the product cost comparison here: CATIA product cost.